Balloon Arches – Balloon Arches are an ideal way to ‘lift’ your room. We have 5 different types of arches to enhance any occasion. Balloon Bouquets – Balloon bouquets enhance any occasion, from bouquets of 7 to gumball-style arrangements. Balloon Exploders – Exploding balloons add some excitement and drama to your event. Shower your guests with cofetti and sparkles! Balloon Canopies & Ceiling Fills – fill your ceiling and brighten your room with a balloon canopy. 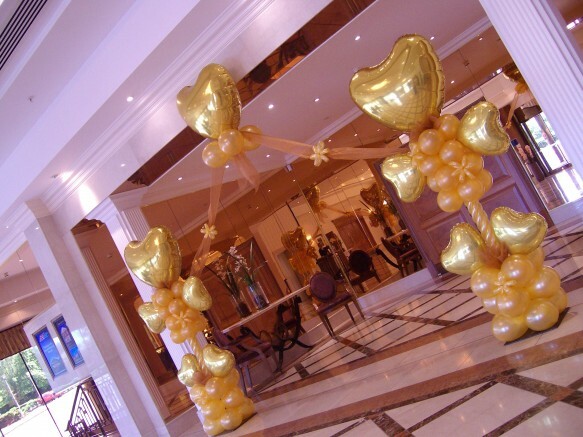 Balloon Swirls – Beautiful balloon swirled hearts and arches give a wonderful effect to your special day. Entrance Decoration – Make a statement and let them know that the event is here with stunning entrance decor.